As a busy Mom, I LOVE when I find a super tasty, gluten free mix that my kiddos will eat and that I can take to parties and friends and they enjoy as well. 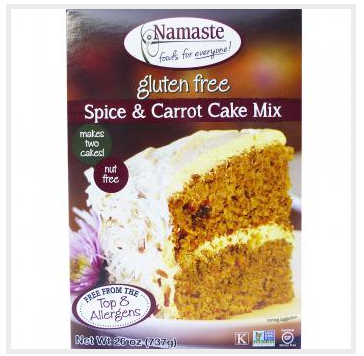 Just add shredded carrots, nuts and raisins and you have a yummy carrot cake muffin. My kids even love this when I make it as a cake and cut into bite size pieces. It still has sugar, but love that it is gluten free. Find at Whole Foods, Nature’s Pantry, Price Chopper and HyVee. Check out Namaste Foods Flour and Brownie Mix. For more information see Namaste Foods.